#32. 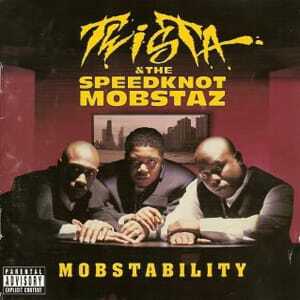 Twista & The Speedknot Mobstaz f/ Newsense "Crook County (Bone Crusher)"
For years there's been disputes regarding who invented the rapid-fire, high-speed Midwest flow in hip-hop. Was it Bone Thugs-N-Harmony out of Cleveland? Or was it the various acts representing the Westside of Chicago (Do or Die, Twista, and Crucial Conflict)? Hell, even Three 6 Mafia staked a claim that it began in Memphis. Things escalated between Chicago and Cleveland when Bone took a shot at Twista on their 1997 single, "Look Into My Eyes," labeling T as a style biter. Not one to back down from a battle, Twista (alongside his protégés the Speedknot Mobstaz) returned fire with "Crook County (Bone Crusher)," an all-out assault on "Hoes-N-Harmony." On this scathing diss, the Mobstaz threatened that Bone would be "seeing Eazy E soon" and claimed that Krayzie played fanboy when the groups crossed paths in New Orleans. The beef was squashed a short while later and both factions went on to record a handful of songs together. But rumors and stories still swirl to this day that Bone had to sneak in and out of Chicago with heightened security during this heated time period.